The Lens this week produced a photo essay of readers enjoying their Monday and Tuesday papers, something they won’t be able to do when The Times-Picayune stops publishing those days and two others sometime this fall. Like a lot of ideas in this town, the photo essay was born on a front porch over an evening bottle of wine. Most of the credit goes to my wife – who, like me, worked at The Picayune for more than 15 years. We thought it would be a nice window into a soon-to-disappear scene, and I quickly contacted a photographer. The next morning, with the wine’s warm glow gone, I worried that the effort might come across as saccharine. But that’s mostly because when I’m not working on investigative stories, I’m a pretty sappy writer – not a skilled photojournalist. Veteran photographer Bevil Knapp hit just the right note without being intrusive, said many of our readers, Facebook commenters, Twitter followers and the well-respected journalism think-tank The Poynter Institute. As many of you know from personal experience, most people read their paper at the same time and same place in their home each day, making those images difficult to capture. Still, Bevil managed to capture many public displays of reflection. Covering the changes at the TP has been a challenge for The Lens. In general, we’re here to fill gaps in citywide news coverage, not to look where others are already reporting. The Gambit has been doing great work on the impending changes at the TP, as have many reporters who cover the media on the national scale. I didn’t think we’d be able to post leaked internal TP memos any faster than JimRomenesko.com or the folks at our alt weekly. But we didn’t think the TP would be photographing its readers anytime soon, so we took that opportunity. Likewise, we didn’t think Gambit or the TP would write extensively about the changes to the state’s law regarding judicial notices that are required to be printed in a local newspaper (though consummate pro reporter Ed Anderson at The Picayune did mention the issue under an unrelated headline). That’s because both publications have a stake in the issue. So we were happy to offer information and a few ballpark dollar amounts for what’s at stake for the paper. The Lens continues to look for the kinds of stories where we can bring a new perspective to the issue without piling on to the extensive coverage that results from such an industry-leading change. For instance, we were happy to repost a story from March that looked at the relatively low broadband subscription rate across the metro area, with an interactive map letting readers drill down to the census tract. We didn’t know then how relevant it would become as the biggest newsgathering operation in town begins to force its readers to go online for news. Clearly, The Lens isn’t against people getting their news online, and we’re grateful for your increasing allegiance to our site. But we also have a list of news outlets with which we collaborate to get our information out though a number of media, including newspaper, radio and television. In the beginning, there was Netscape. And it was good. It’s been a strange road from 1995, before The Times-Picayune’s parent company, Advance Publications, set up nola.com as a separate company and started this whole process. That year, I sat in a forgotten wood-paneled office behind the sports department, watching the TP’s graphics chief, Paul Fresty, test out the BourboCam. Then, the Web effort was still based in the newsroom – where reporters had to go to a separate room and log on to the Internet through one of five computers connected through dial-up modems. The Bourbocam and the TP’s website were something of a novelty, not a way of life. 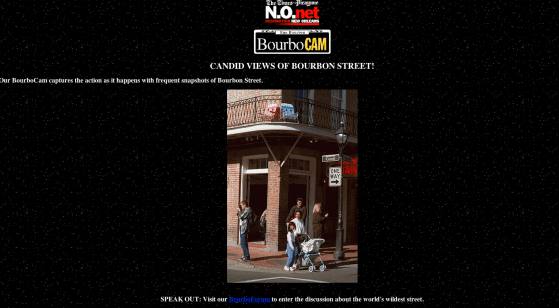 That remote camera, set up at Bourbon and St. Peter, was an early success for the site, letting people mug for their Internet-connected friends back home. Rather than the every-two-minute still shot or eventual streaming from the Cat’s Meow window, TP photographers were being dispatched to take a shot of the street and drive it back to the office. I’ll leave you with this Jan. 7, 1996 story that talks about the gee-whiz nature of a new effort, with some revealing predictions. Apologies to Chris Gray, who probably wishes she doesn’t remember writing this. The Destination New Orleans section of N.O.net, run by The Times-Picayune, hopes to become a key Internet source for travelers planning vacations to New Orleans while giving local users access to years of newspaper research on the best of the area’s food and culture. N.O.net is available free to subscribers of commercial online services or local Internet access providers such as Communique Inc., which hosts the site on its computers. It is best viewed through the Netscape Web browsers, but can also be seen through other browsers users may have on their home computers. While N.O.net carries restaurant reviews and other information from The Times-Picayune, it is not an online version of the newspaper, but a new product specifically designed for the Internet audience. Times-Picayune Editor Jim Amoss said that N.O.net would complement the coverage the newspaper already gives readers. Unlike many Web sites, N.O.net intends to turn a profit, a tough goal in the still-struggling medium. So far the site has two advertisers, Arnaud’s and Remoulade restaurants, which post menus and allow users to make reservations through their computers. But Diamond foresees a full-scale online mall of commercial services, where users will be able to buy concert tickets, shop for souvenirs and plan an entire New Orleans trip from their living rooms. If the site takes off, N.O.net may add services such as a New Orleans business report, a hunting and fishing report, and local news online. N.O.net is the result of months of work by a team of Times-Picayune editors, graphic designers and copy editors. Renee Peck, former editor of Lagniappe, wrote and edited the material. The site was designed by Paul Fresty, the newspaper’s graphics editor. Systems editor Michael Kleinschrodt was in charge of production. The team was supervised by Dan Shea, the newspaper’s associate editor.